JCB are showcasing its first ever fully electric mini excavator, a new tandem roller and a I-tonne site dumper at this year’s Executive Hire Show, which kicks off today. 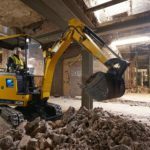 JCB has launched its first ever full electric mini excavator, the 19C-1E – a powerful compact model with zero exhaust emissions and one that is considerably quieter than a standard machine. 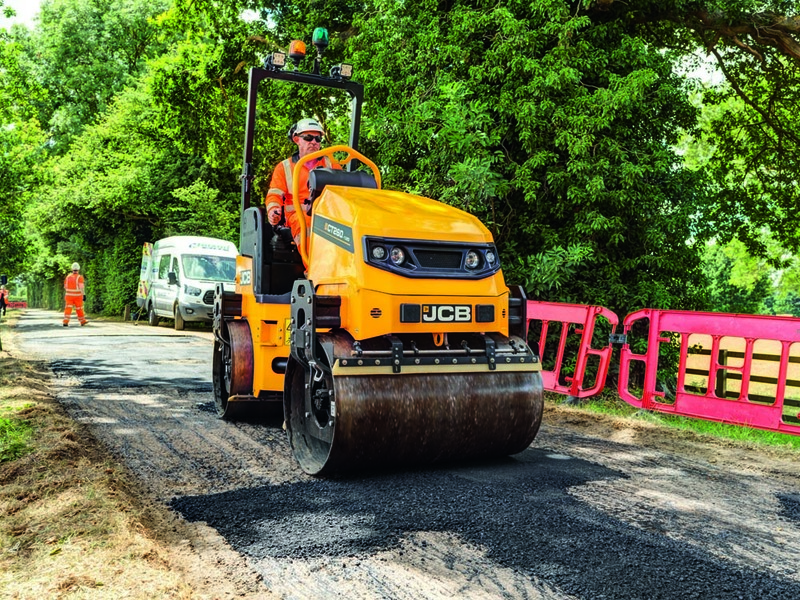 The JCB 19C-1E can be powered by three or four lithium-ion batteries, to provide 15kWh or an optional 20kWh of energy storage. This is enough for a full working shift for the majority of mini excavator customers. The machine is initially equipped with both 110V and 230V charging, while a fast charge option will be available. The 230V 16A supply requires an eight-hour charge time from empty, while the 110V supply would require a 12-hour charge time. The batteries have been designed to last the operating life of the machine. The high efficiency of this advanced electric-hydraulic combination means only a small hydraulic cooler with a small thermostatic electric fan and no engine radiator – contributing to longer battery life and the lower noise level. With no daily checks of coolant and engine oil levels required, the machine can commence work quicker than its diesel counterpart. 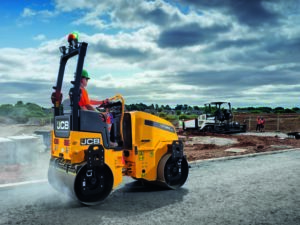 The new CT260 tandem vibratory roller is designed to simplify operation and maintenance, while increasing productivity and return on investment. The CT260 is available in two drum sizes width 1,000mm and 1,200mm widths. Built for both asphalt and base layer compaction, the roller’s completely new hourglass design delivers excellent visibility to both sides of the drums. The articulated chassis also offers access to the driver’s seat from either side, with integrated grab handles and an obstruction-free floor providing plenty of space for taller operators. The spacious operator platform is isolated using anti-vibration mounts, for improved comfort. A single responsive drive lever allows smooth operation and there are three switchable vibration settings – for both, or independent front or rear, drums. 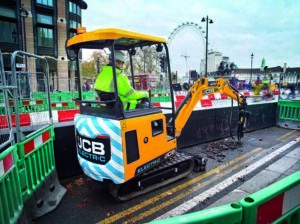 Automatic Vibration Control is standard, while an easy to adjust off-set facility increases versatility, making it easier to work around raised ironwork and kerbs. The main control panel has easy to understand work modes with large switches that can be operated with a gloved hand. A pressurised water system has a single switch for easy use and both the fuel and water tanks have easy access to drain points. In addition, the moulded water tank has the words WATER ONLY embossed in the design, to reduce the chance of cross contamination. The water tank cap is now white, to avoid confusion with the blue caps used by other manufacturers that require an AdBlue tank. The new CT260 is powered by a proven Tier 4 Final, EU Stage V certified engine that uses mechanical injection and no diesel particulate filter (DPF). An operator-present seat switch has a timed cut-out delay, to allow free movement on the seat during operation, while all electrics are IP67 and IP69 compliant, to withstand power-washing for faster rental turn-around. A full width tilting engine canopy provides easy access to all regular service points and JCB’s LiveLink telematics system is standard, providing customers with location and operational data, including when the vibration system is in use. The new central articulation joint is maintenance-free, cutting greasing time and operating cost, while preventing neglect for rental customers. Options include a folding ROPS canopy, road lights, a seat-belt activated green beacon, a white noise alarm and LED working lights. 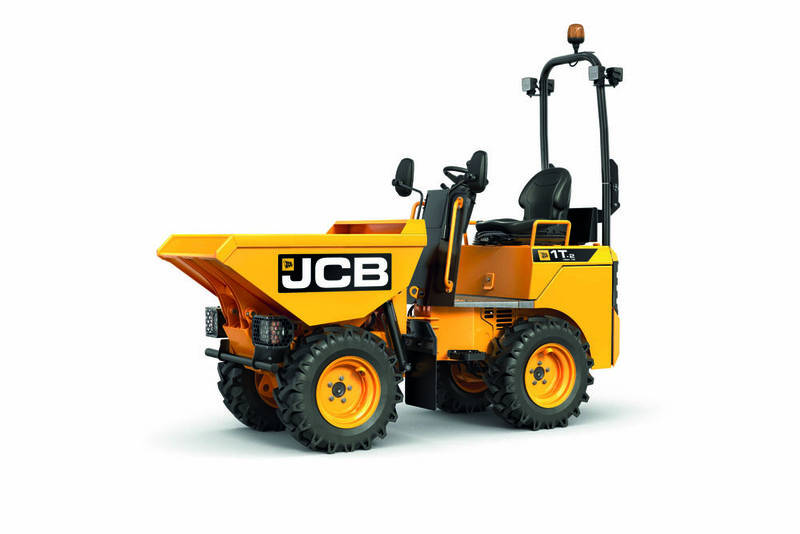 Finally, JCB is to launch a new 1-tonne site dumper, set to become the safest machine in its class. Powered by a Tier 4 Final, EU stage V certified engine, the dumper is shown for the first time at the Executive Hire Show. The new 1T-2 model benefits from a series of safety features. It incorporates the unique JCB Drive Inhibit System proven on JCB’s larger 6, 7 & 9 tonne machines. This seatbelt logic feature prevents the machine being operated without lap belt engagement, while there will be an audible movement alarm alerting bystanders to any imminent machine movement. A parking brake button, which locks the drivetrain to ensure the machine remains stationary, is fitted as standard. With an operating weight of 1515kg and a payload of 1000kg, the new machine also sees the introduction of a 16.1kW Stage V certified diesel engine. Its hydrostatic drivetrain with intuitive “stop & go” pedal makes the compact machine ideal for both novice and experienced operators. The standard machine is 1.1m wide, while a narrow tyre option reduces the width to less than 1 metre – meaning the machine can travel through a narrow doorway. The compact machine adopts a two-pin articulation joint, along with the same heavy-duty, all-steel construction as its larger stablemates. A two-year manufacturer’s warranty will be included as standard, demonstrating JCB’s confidence in the build quality and durability of the dumpers. Furthermore, optional JCB LiveLink telematics deliver machine location information and geofencing capability for enhanced security.